Whirley | Scuffalong: Genealogy. 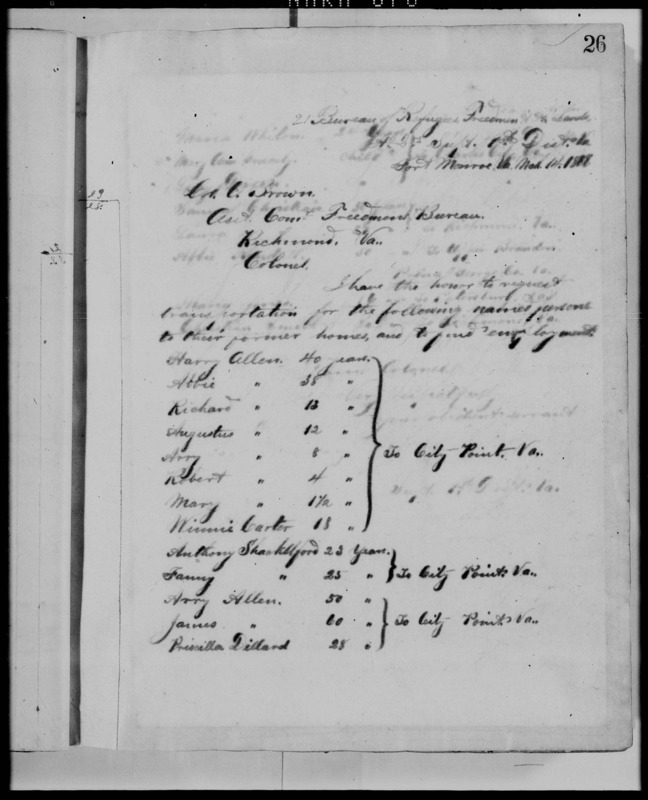 Whirley – Scuffalong: Genealogy. That Graham Whirley‘s death by gunshot was not reported salaciously says a lot about the regard in which he was held both inside and out of his community in Hopewell. “Will My Mother Know Me There?” — we’ll come back to that. This brief piece was published 14 September. 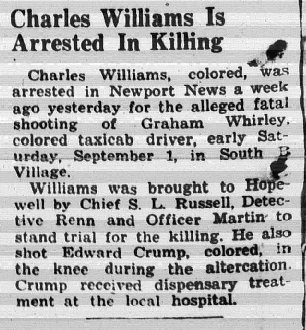 I haven’t yet found follow-up articles that reveal details of Graham Whirley and Charles Williams’ fatal encounter or of the outcome of Williams’ trial. What I have found, however, are numerous examples of the esteem in which Hopewell’s working-class African-American community held this relatively young man. In the middle of this, on 22 May 1944, the column announced that “Mr. and Mrs. Graham Whirley of City Point have returned after spending their honeymoon in Baltimore, Maryland.” That, of course, was where his half-brother John Whirley and sister Matilda Whirley Brinage lived. Just sixteen months after he remarried, Graham Whirley, taxi driver and sought-after soloist, was dead. Despite his move across the James River, he had never left his home church, and he is buried at New Vine. 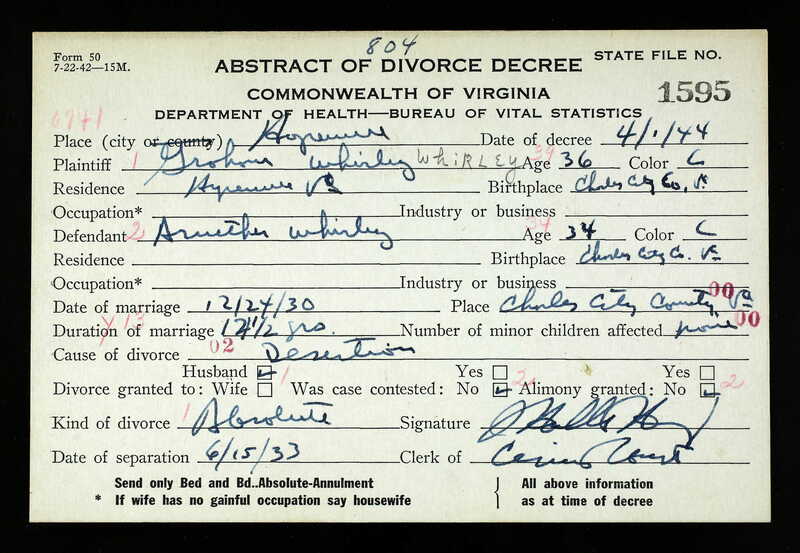 The Commonwealth of Virginia has thrilled and astonished me by making vital records available via Ancestry.com. Yesterday, cousin Barbie Jones notified me that the databases were up and open, and I thank her for part in the gargantuan task of indexing these documents. 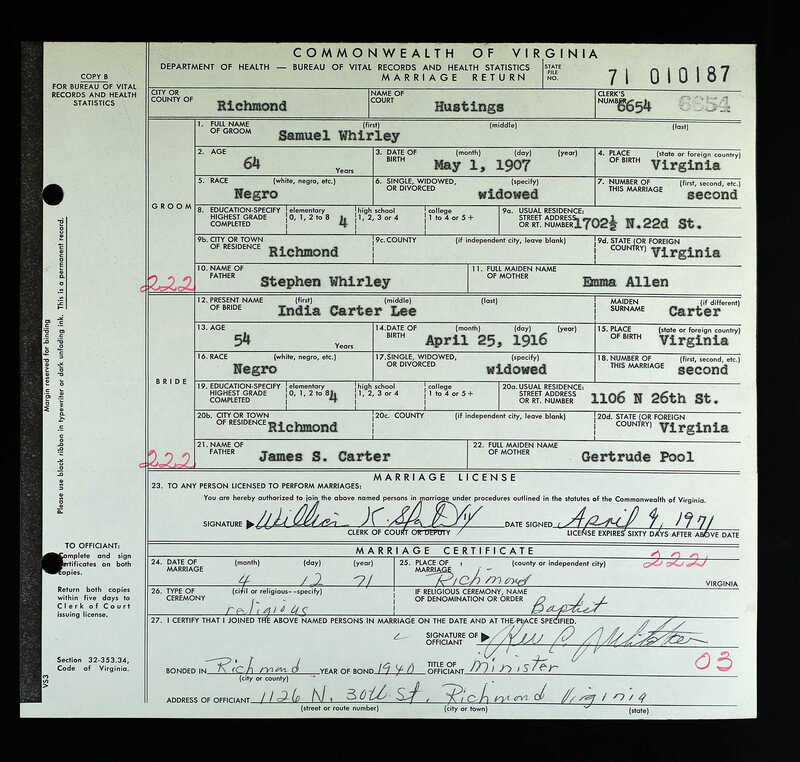 Just as with North Carolina Marriages a couple of months ago, Virginia Birth, Marriage and Death Records are unveiling little mysteries and setting records straight. I’ll start with the Allens. In the 1900 census, Graham Allen is listed in Charles City County, Virginia, with wife Mary, sons Alexander and Edward, and grandsons Milton and Junius. My assumption has always been that Graham and Mary’s eldest daughter Emma was the mother of the younger boys. So, yes. Conjecture confirmed. 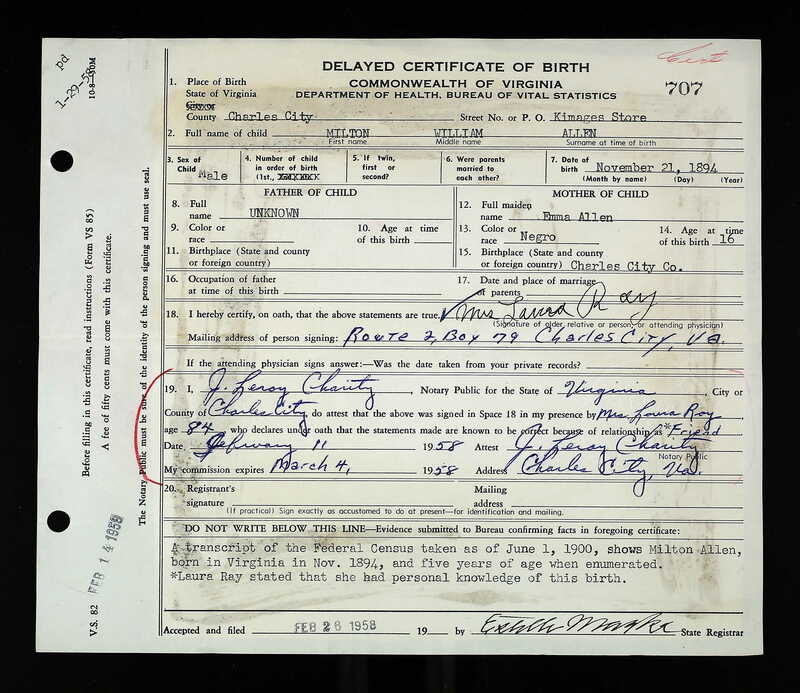 Milton William Allen — the middle name is new to me– was 16 year-old Emma’s son. Who was Mrs. Laura Ray, “friend”? And Milton was alive as late as 1958??? Where was he living? Is this right? Was Junius really Graham and Mary’s youngest child? (For a fact, my grandmother told me Junius was John C. Allen‘s brother, but I figured this was a manner of speaking.) And who is James Dobson, “uncle” and “a neighbor at the time,” who attested to Junius’ birth for this delayed certificate? And when did Junius move to Paterson, New Jersey? And there was once a King James Bible recording family births and deaths? No surprises, but who was informant Joseph Ghee? A bit of a sad surprise. As I wrote here, Graham’s brother Samuel is the one who’d had a brush with infamy, yet Graham ends up shot in the chest. Where was South “B” Village? Taxi driver and wood dealer? And where did his wife pull “Binford” from as Emma’s maiden name? Samuel Whirley, at least, lived a longish life. Laura Ray appears in the 1900 census of Harrison, Charles City County, with husband Graham Ray and three children. 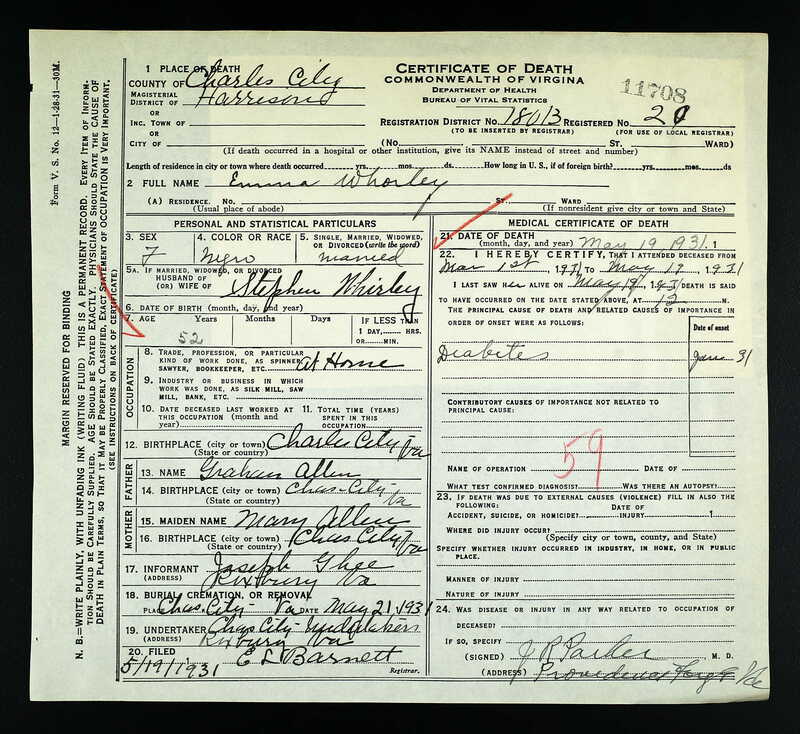 Laura Ann Wray’s death certificate shows that she was born 24 September 1873 to Lennie Glenn and “Annie” and died 12 June 1958 in Harrison district, Charles City. She was buried at New Vine church. Her husband Graham Wray’s death certificate reveals that he was born about 1871 to John Wray and Margaret Jones, that he was a farmer, that he died 3 March 1916, and that he was also buried at New Vine. New Vine, of course, was the Allen family’s church, too. I don’t have a death certificate, but the Social Security Death Index shows that Junius Allen, born 22 February 1896, died in January 1975 in Paterson, New Jersey. He had obtained his Social Security number prior to 1951 in New Jersey. Junius’ handwriting had immeasurably improved since his scrawl on his World War I draft registration card. A James Henry Dobson, self-employed barber and minister born 25 December 1884, registered for the World War II draft in Paterson, New Jersey. He reported being born in Richmond, Virginia, and named Mrs. Lavinia McKay as his contact person. Is this the same man? (The James Dobson above was born about 1875.) How could he have been Junius’ uncle? Joseph Wiley Ghee’s death certificate reveals that he was born in 1897 in Charles City County to Robert S. and Lovey Williams Ghee, that he died in 1957, and that he was buried at New Vine. He was a member of the Allens’ church then, and there’s no evidence so far that he was related to Emma. As I’ll show elsewhere, Graham’s life contrasted sharply with his violent death. Newspaper accounts reveal that he was a church man, popular about town, and respected in and outside his community. I mused earlier that it was hard to believe that of Mary Brown Allen’s children, only John and Emma had children. 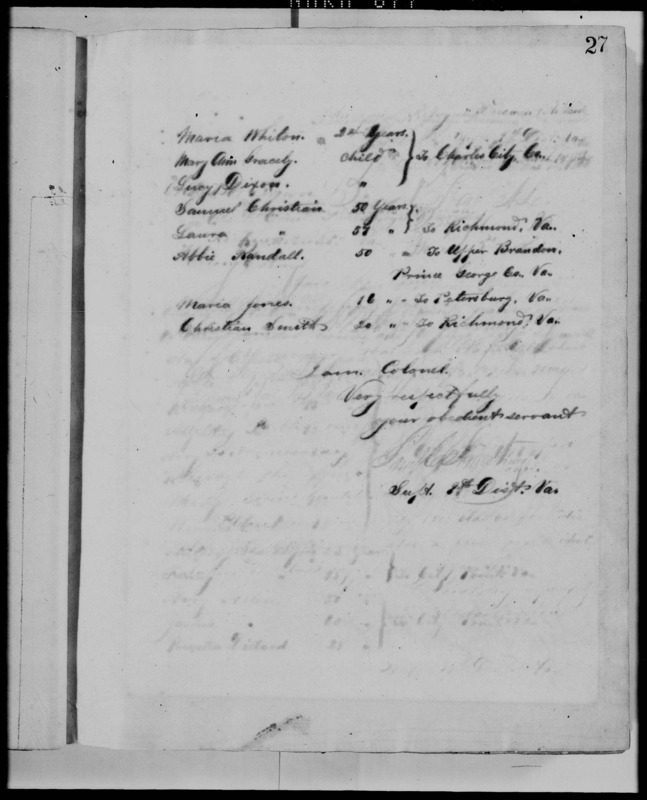 Emma’s sole known grandchild died childless, leaving my great-grandfather’s relatively few descendants as the only extant Allens. (By my count, we number only 25 across three generations. Twenty-five.) These additional records do not change that scenario. Neither Samuel nor Graham Whirley had children, and I’ve seen no evidence that Junius or Milton did. Funeral Program Friday: Matilda Whirley. Morning Star Baptist Church of Christ/In Remembrance. MATILDA WHIRLEY. December 7, 1910-March 5, 1992. Matilda “Tillie” Whirley, one of Stephen and Emma Whirley’s eight children, was born on December 7, 1910 in Charles County, Virginia. She was educated in the public schools of Charles County until moving to Baltimore, Maryland. There she completed her education by attending evening classes. For nineteen years, Miss Whirley worked as a housekeeper in the Ashburton section of Baltimore. She subsequently obtained employment at the University of Maryland, School of Dentistry from which she retired after working there for seventeen years. At an early age Tillie received Christ as her personal Savior and became an active member of the New Vine Baptist Church in Charles County, Virginia. She was guided in the work of the church by her God-fearing parents. Her mother instructed her in baking the bread for the Lord’s Supper each month and Tillie, believing this was her sacred duty, continued baking the bread until she left Charles County. After relocating to Baltimore, Maryland, Miss Whirley became affiliated with the Morning Star Baptist Church, under the pastorate of the late Reverend George Jacob Garnett. Because of her strong background as a servant of God, she became a great servant of mankind. At Morning Star, Miss Whirley was a member of the Senior Usher Board, Missionary Society, Samuel Ray Revival Choir, Church School, Building Fund, Lottie Henry Nurses’ Unit, Flower Circle, Women’s Ministry and Board of Christian Education. She was also a member, and later president, of the Pastor’s Aid and a loyal supporter of the Girl Scouts, Fuel Fund, Elevator Fund and any other fund or organization which would benefit her church or community. Miss Whirley was a devoted, loving, effectual, caring Christian woman and was a friend to all who needed her. She freely gave wise and timely counsel, based on her life experiences, as she sought to make life go a bit smoother for her family, friends, church members, neighbors and co-workers. Miss Whirley was counted upon to be an integral part of church and community activities and participated and served wherever she could. Her dedication and love of God was evident in all she did. Miss Whirley was a good example of one of God’s servants; because of that, we take time to remember her this month. My cousin is the fourth man in this family to bear his name, and those four generations of Johns are the exact measure of my Allen lineage. When Graham Allen married Mary Brown in Charles City County, Virginia, on 22 June 1876, she was six months pregnant with a white man’s child. We know nothing of the circumstances of conception, and nothing of the man’s identity beyond the Y-haplotype — R1b1b2a1a1 — that my uncles and cousins carry. [Update: I have identified John C. Allen‘s father.] Graham adopted Mary’s baby boy at birth, gave him his name, and reared him, as far as we know, with no distinction from their later children. So. We are Allens. “I have the honor to request transportation for the following named persons to their former homes, and to find employment,” wrote Samuel C. Armstrong, Superintendent of the Freedmen’s Bureau 1st District (and founder of Hampton Institute, which educated a dozen Allens between 1927 and the present.) Among those to be transported, Harry and Abbie Allen and their children and Anthony and Fanny Shackleford. City Point, in Prince George County, had been headquarters of the Union Army during the siege of Petersburg in the Civil War. The Allens and Shacklefords likely were refugees, so-called “contraband,” who fled their owners during the war to join a large camp near Fort Monroe. (For recent news of archaeological digs at the former Grand Contraband Camp in Hampton, see here.) Though none has surfaced to date, I will continue to look for links between these families and Edmund or Susan Allen. In the 1880 census of Harrison, Charles City County, 26 year-old farm laborer Gram Allen’s household includes wife Mary and children Nannie, 5, John, 3, and Emma, 1. I suspect that Nannie was Mary’s child by a previous relationship, but I don’t know. In the next few years, Mary gave birth to a son Willie, who died of burns in October 1885. (Graham Allen, who provided information, is listed on the boy’s death certificate as father, but the mother’s name is given as Sarah. A misunderstanding? A mistranscription? And “outside” child?) A month later, Mary gave birth to Alexander Allen. Two years later, in December 1887, Graham Allen reported the death of Mary Allen, age 30. Graham’s relationship to the deceased was not stated, but this was not his wife. In 1892, Mary Brown Allen gave birth to her last child, son Edward Noble Allen. In 1896 and 1899, daughter Emma Allen gave birth to sons Milton and Junius Allen in Charles City County. I do not know their fathers. On 18 Aug 1898, at Charles City County Courthouse, Graham Allen filed a deed for the purchase of two parcels on Hyde Road, one 12 acres and the other 2 3/4 acres, from A.H. Drewry et ux. A plat filed with the deed shows a roughly trapezoidal lot 2 1/2 miles from Rolands Mill, surrounded by the land of Sarah Jones, Edward Jones, Frank Martin, and Peter Jefferson. In the 1900 census of Harrison, Charles City County, Graham Allen is listed with wife Mary, sons Alexander and Edward, and grandsons Milton and Junius. (I believe they were Emma Allen’s sons.) Mary was illiterate, but Graham could read and write. Mary reported 4 of 8 children living. (John, Emma, Alex and Ed, living; Nannie, Willie and who, dead?) As detailed here, John had moved to the city by the late 1890s and married Mary Agnes Holmes in 1899. On 3 Apr 1901, Emma Allen, 22, married widowed laborer Stephen Whorley [Whirley], 32, son of Stephen and Patsy Whorley. W.E. Carter performed the ceremony at Graham Allen’s residence. On 11 March 1902, at Charles City County Courthouse, Graham Allen filed a deed (book 17, page 437) for the purchase for $16 of 2 3/4 acres in the Grafton tract from Mary Harrison Drewry. The sale was made 27 Feb 1902, and the tract was located 4 miles northwest of Drewry’s Mill. Two years later, he filed a deed or the purchase of 4 1/2 acres in Turkey Trot from M.E. and W.E. Stagg and in 1909 filed another (book 20, page 165) for the purchase for $12 of 2 1/4 acres in the Bishops tract, west of Old Hyde Road in Turkey Trot, bordered on the east by Graham ‘s own land and True Reformers and on west by Peter, James B. and Elvina Jefferson and M.E. Stagg. Mary Brown Allen died 1 Apr 1916, aged 67 in Harrison township, Charles City County. 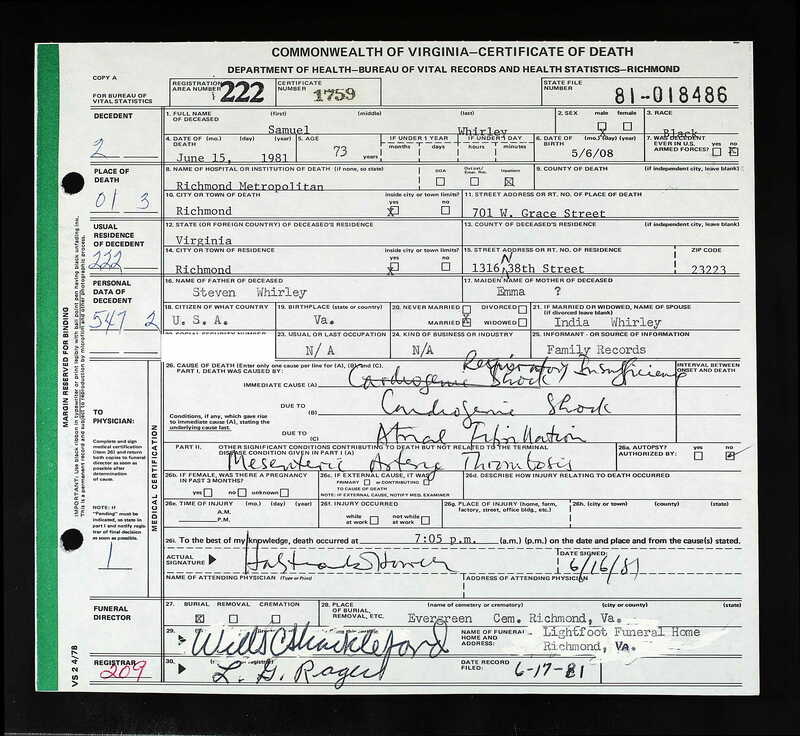 Her death certificate reports that she was born in Amelia County, Virginia, to James Brown and Catherine Booker, both born in Virginia. She was buried 2 Apr 1916, and Junius Allen of Roxbury was informant for the certificate. I have not found a card for Alexander and assume he died before the war. Edward actually served; I don’t know about Milton and Junius. In the 1920 census of Harrison, Charles City County, on Kemmiges Road, Stephen Whirley, farmer, is listed with wife Emma and children Samuel, Graham, Matilda and Susie. John and his family remained in Newport News, as did “Junnus” Allen and his wife Margaret, with brother-in-law Samuel Johnson, at 1752 Ivy Avenue. Junius worked as a transfer drayman; Samuel as a bricklayer at the shipyard. Edward may have been living and working in Washington County, New York. Milton was definitely gone. In the 1920 census of Kokomo, Howard County, Indiana, at 1011 North LaFontaine Street, there is a listing for Virginia-born Milton Allen, single, age 21, living as a roomer in a household headed by Myrtle Harston. Milton worked as a laborer in a stove factory. On 10 January 1928, Graham Allen died of cerebral hemorrhage at the age of about 74. According to informant William Webb, Graham was born in Charles City County to unknown parents and left a widow, Lena Charles. 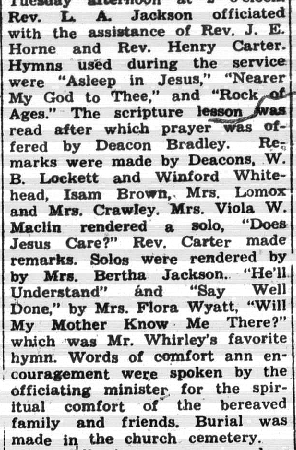 He was buried at New Vine Church on 14 January 1928. In the 1930 census of Harrison, Charles City County: Emma Whirley and daughter Susie were listed “cook-private family” in household of Eugene A. Dietrich, a German-American grocery merchant. I have not found Edward, though I believe he was living in Charles City County. Nor can I locate Milton and Junius. (There is a Junius Allen listed in Newport News city directories in the 1940s, but I am not certain they are the same man. There is also a Junius Allen listed in the 1902 directory, which definitely is not Emma’s son, so I am cautious.) At least one of Emma’s children had gone North by this time and is found with her daughter in the 1930 census of Baltimore, Maryland, living with her half-brother. At 1314 Mulberry Street, rented for $40, are listed John W. Whirley, 31, wife Susie, 28, sister Matilda, 20, boarder Sam Bradley, 30, and niece Dorothy Whirley, 1. John worked as a laborer in a car shop; Matilda as a laundress in a laundry; and Sam as a hospital waiter. All were born in Virginia except Susie, who was born in South Carolina. 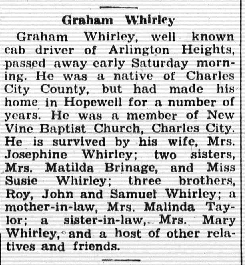 On 24 Dec 1930, in Charles City County, Graham Whirley, 22, laborer, son of Stephen Whirley and Emma Allen, residing Roxbury, married Arnether A. Harris, 20, daughter of John A. Harris and Mary Jefferson, residing in Providence Forge. 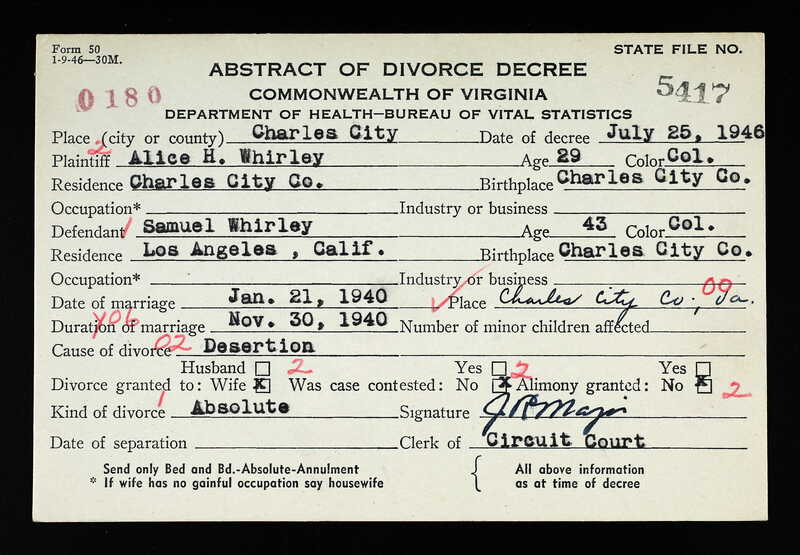 I have not found Samuel Whirley in 1930. Edward N. Allen died 25 Jan 1933 at the Marine Hospital in Norfolk, Virginia, of aortic aneurism and valvular heart disease. 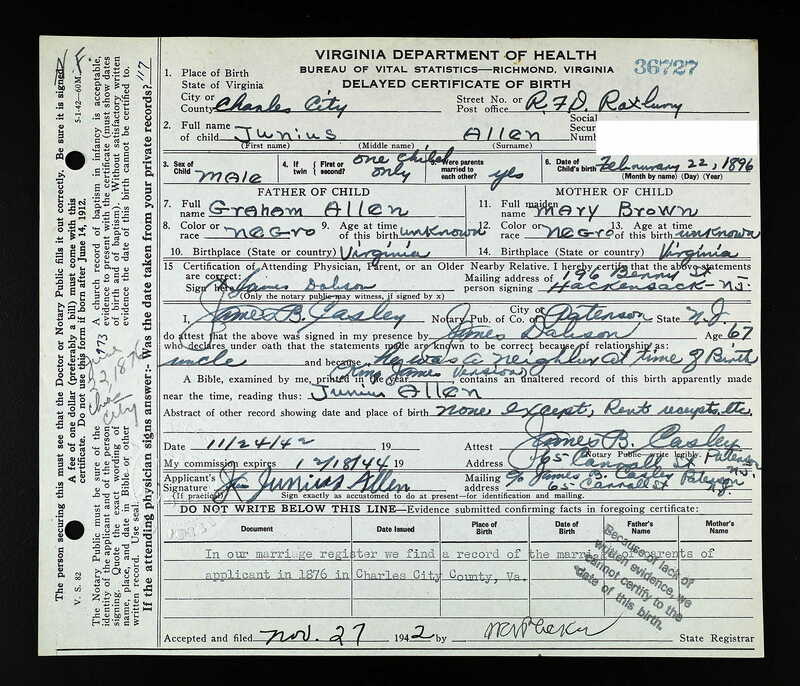 Based on information he provided as a patient, Edward’s death certificate reported that he was born 17 May 1890 to Graham Allen and Mary Brown of Virginia and resided at RFD#2, Box 66, Roxbury, Virginia. 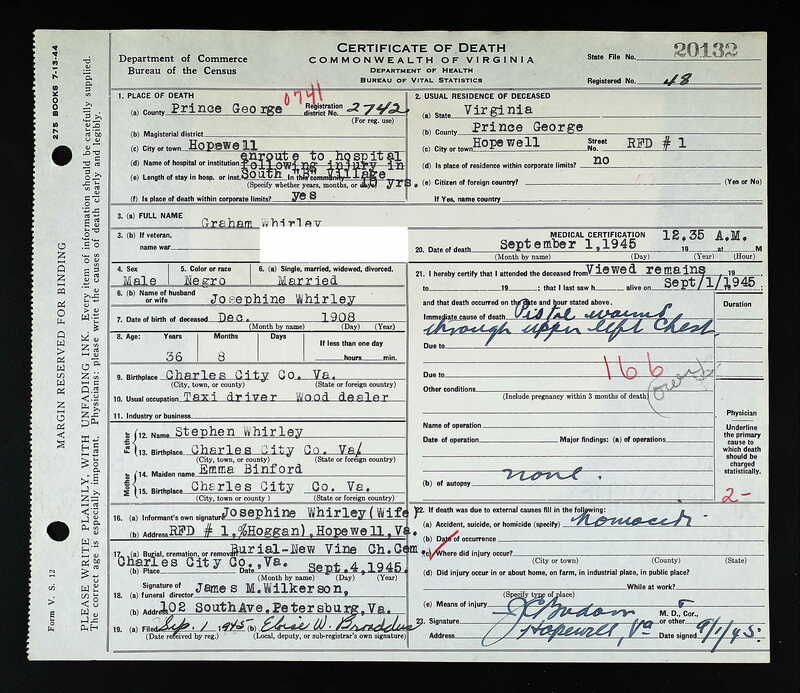 Edward was buried 30 Jan 1933 at Hampton National Cemetery, in section Fii, Site 6459-A. In 1935, Samuel Whirley made a splash in Fredericksburg, Virginia, newspapers after being on the lam for a year on larceny and false pretense charges. It’s not clear whether this one-armed man was Emma Allen Whirley’s son, but an article noted that he had spent time in Baltimore while on the run. In the 1940 census of Hopewell, Virginia, at 601 Maplewood Avenue, Graham Whirley, 25, a chemical plant laborer, is listed as a lodger with Andrew and Lena Joyner. There is no sign of his wife. 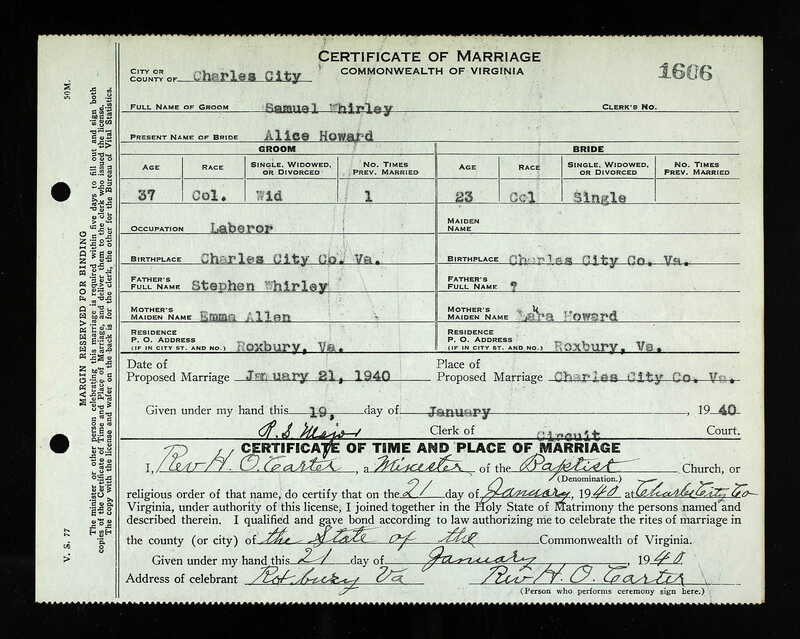 On 21 January of that year, in Charles City County, his past behind him, Samuel Whirley, 37, born in Charles City County to Stephen Whirley and Emma Allen, residing Petersburg, married Alice Howard, 23, born Charles City County to Laura Howard. The rest of the Whirleys — Emma, Susan, Matilda — are nowhere to be found, though I know they were living. Similarly, of the Allens, I can only place John and his children. I lose the thread of my great-grandfather’s extended family after 1940. I’ve written of my brief and unsatisfactory telephone conversation with Dorothy Whirley in 1996. She had no children, nor did Edward Allen, but it’s hard to believe that none of Graham’s sons, save John, or his grandchildren by his daughter Emma, have contemporary descendants. I called her cold, admittedly. Never could she have expected to pick up the phone to a call from her great-uncle’s great-granddaughter. Still, I’ve made lots of these kinds of calls in my life. Dorothy Whirley was decidedly more guarded than most and had a little edge in her voice that sounded almost irritated. She could not deny me though, for what slick stranger could pull names and dates out of Charles City County like that? Dorothy was the daughter of Matilda Whirley and granddaughter of Emma Allen Whirley, my great-grandfather’s sister. Dorothy could not, or would not, tell me much, except to confirm that Emma, her husband and children had migrated to Baltimore, where she continued to live. Her mother, to whom she had been very close, had died not too many years before our connection, and she seemed somewhat estranged from her remaining kin. She knew of John Allen Sr., but had little more to say about him than that he held himself apart from — thought himself better than — his half-siblings because of his light skin. Our conversation foundered, and I hung up with a promise to send her a family tree. I never got around to it, and she died in 1999. 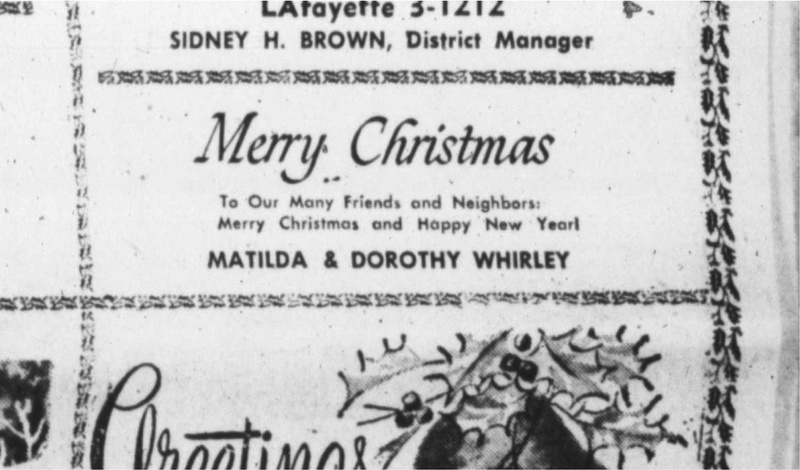 I have not been able to track down any other living Whirleys, but have found small traces of Dorothy and her mother. The Baltimore Afro-American, 26 December 1959. Cousin John gets off lightly. Baltimorean Attends Services for Father. CHARLES CITY COUNTY, VA. – Memorial services for the late Stephen Whirley, who served as deacon at the New Vine Baptist Church for 47 years, prior to his death seven years ago, were held Memorial Day at the church. Among the out-of-towners attending was a son, John Whirley, proprietor of Club Ubangi café and nightclub in Baltimore. — Baltimore Afro-American, 4 Jun 1949. Friday, Sept. 10, was Welfare Check Day in Baltimore. That’s “Mother’s Day” when the money flows (“one great big bash”) and crime soars (“reaches its peak”), all according to Jerry Cartledge, author of the News American’s “Welfare Wastelands” series. Seven AFRO staffers decided if American reporters can risk their lives in such places as Vietnam, they could venture out on “Mother’s Day” in Baltimore. They found the day and night like any other Friday or Saturday and concluded that much of the Mother’s Day piece was pure fantasy which appears questionable in so far as personnel [sic] observation and interview can determine – and that those charges that can checked by police or court records definitely are false. The busy and dangerous places cited in the article include Pennsylvania, Fulton and Fremont Aves., Gay, Orleans and Madison Sts. ; the Wagon Wheel, the Ubangi Club, the Sportsmen, “Della’s” and the Charleston. The AFRO team hit them all – and some others – and still could not find justify charges that “Mother’s Day” is the worst every month. John Whirley of the Ubangi Club said, “I never saw or talked to Cartledge. Nobody has been in here seeing the things in the article. Two or so welfare people might come in here. The receipts (on Mother’s Day) are the same as any other day without the checks. … — Baltimore Afro-American, 14 Sep 1965. Numbers Personalities Pay Fines of $8,500. BALTIMORE. Appearing in Criminal Court this week were nearly two dozen numbers personalities who in 1968 were known to literally thousands of lottery players in all sections of the city. In the group were nine defendants who paid a total of $8,750 in fines alone. Two persons received jail sentences. One defendant swallowed a numbers slip. Another drove his car in reverse up the street to avoid police and a veteran Avenue bar owner and a longtime South Baltimore real estate dealer pleaded guilty. Getting off lighter was another familiar Avenue figure, John Whirley, 70, owner of the 2200 block Pennsylvania Ave. Ubangi Bar. Judge Sodaro suspended a prison sentence of three months and imposed a $250 fine and costs on the elderly man who pleaded guilty to lottery violations. According to testimony before the court, Whirley was arrested in a Vice-Squad raid on his bar at 11:20 a.m., Nov. 25, 1968. An arresting officer said he found one slip indicating $2.50 in play wrapped in a roll of $55 cash in Whirley’s pocket. In the basement, according to testimony, there were two slips containing 15 numbers and $11.50 in play. — Baltimore Afro-American, 2 Aug 1969.